About Ridgefield, CT – Happy to be your hometown Heating & Air Conditioning Contractor! Ridgefield, located in Fairfield County, has a population of approximately 24,000 and is surrounded by the natural beauty provided in no small part by the Berkshire Mountains. Adding to the scenic wonders, Ridgefield’s Parks and Recreation Department also maintains 21 athletic fields and parks, including the five-acre Ballard Park that offers lush greens, an Imagination Station playground, and a popular place to gather for live music and/or entertainment. 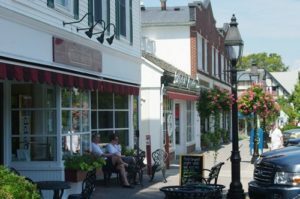 Ridgefield, often cited as one of the best places to live in Connecticut, takes pride in its rich history and culture, and nowhere is that more evident than on the lovely Main Street, with its mile-long stretch of stately homes, museums, churches, and great places to shop and eat. It is the Ridgefield Historic Society’s goal to preserve the rich history of Ridgefield, and they work hard to maintain such historic landmarks as the Peter Parley [one room] School House and the Keeler Tavern Museum and Garden House. The public school system in Ridgefield is exemplar, with Ridgefield High School being a distinguished Great Schools’ 10 out of 10 rating recipient. Ridgefield also has a crime rate that is significantly lower than both state and national averages, house values above them, and a strong sense of community. With shopping aplenty such as can be found at any of the elegant or quaint shops along the quintessential Main Street; dining that is second-to-none such as the authentic French fair that can be found at Luc’s Café, or the southwest Mexican cuisine Southwest Cafe; and culture that will rival the best, such as Ridgefield Symphony or the Aldrich Contemporary Art Musuem, Ridgefield is undoubtedly a great place to visit or call home. Many famous people have been affiliated with Ridgefield, including actor Robert Vaughn and American portrait artist John Howard Sanden. Where are the most consistent temperatures on the planet? Inside your home, of course. And we help keep them that way all year long with heating and cooling services we’re confident will exceed your expectations. Home heating wise, we also can help prevent repair problems with annual preventative maintenance, a service you’ll receive automatically when you enroll in our Maintenance Agreement Program. If and when repair work is needed, you can count on for outstanding workmanship on all makes and models. We also can design and install a new or replacement system that fits your home, lifestyle, and budget to a tee.